Set amid woodland and beautiful gardens, Castlecoote House is a wonderful, historic, Georgian building encircled by a fast flowing river in County Roscommon. This elegant family home combines 18th century architecture, fine plaster-work ceilings and marble period fireplaces with the ultimate in 21st century comfort. 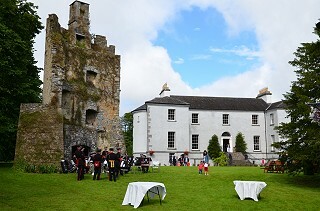 Castlecoote House is also the venue for the annual “Percy French Festival & Summer School” in the second week of July. Percy French (1854 - 1920), a native of County Roscommon, was the foremost songwriter and storyteller of his day. In more recent times, he has also become recognised for his watercolour paintings. The event features lectures, recitals, poems, monologues, music, drama and paintings celebrating the life and times of this multi-talented character. The school features prominent speakers covering the historical, cultural, social and political context of his life and works.